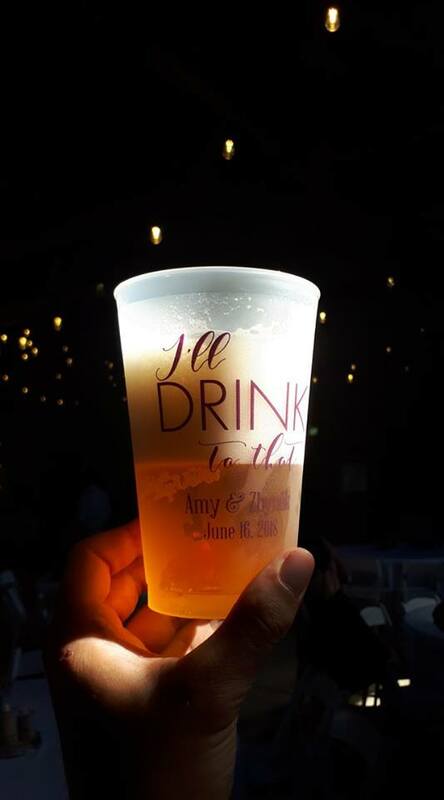 A step up from our popular 16 ounce cups, 20 ounce frosted plastic favor cups are most popular for serving keg beer and as refillable mixed drink cups at all-inclusive resort weddings. Couples order these cups and have them shipped to their destination hotel or resort to be used by the bar to serve mixed drinks to guests during the reception. Guests keep their cups and bring them up to the bar when they need a refill. Personalized with choice of design or monogram and up to 4 lines of custom print on the front and back, these cups will impress everyone at your destination wedding. Made from BPA free, shatterproof plastic, these dishwasher-safe cups measure 5 3/4 inches high and 3 3/4 inches in diameter at the widest point and will hold up to 20 fluid ounces when full to the brim, comfortably holding about 18 ounces. Choose from a wide range of designs, letter styles and imprint when making your wedding favor cups. Printing on the front and back side of your cups is available at no additional charge. These are a great idea for favors for your wedding or any celebration! We ordered our cups for our wedding and I was disappointed in the durability of them for the price... I could of went to the dollar store and bought a more durable cup and put the wording on myself. they came out fine however I would never order from this site again. The only plus was how quickly the cups shipped and were delivered. These glasses turned out great! Everyone really loved them and they were a great detail on our wedding day! The cups turned out perfect and I am so thankful for the design generator and the pre-populated options. We are very excited to hand these out at our wedding and not have any glasses get broken. I loved the cups that I ordered!! They were a hit with our wedding guests and several people took them home to remember the fun they had! I ordered the 20 oz cups and they were perfect! Thank you so much, we loved them. These cups are amazing, the logo was bigger than I expected and they look awesome. Can't wait for our wedding day and everyone to receive one. Oh and super fast turn around!!! My daughter loved her personalized cups! We ordered these 20 oz Frosted Plastic Cups and they turned out wonderful. Just like the picture. I would recommend this site for fast and accurate service. Love the cups, just wish the print was a little darker. These cups are amazing. Designed and delivered on time. Perfect for our wedding. Highly recommend. Great price for size and quality. Love the cups! The plastic is good quality and they look very nice. They were perfect! Just what I wanted! the cups were perfect for our daughter's graduation party. They looked great and were sturdy. Guests loved them. Really like the way the cups turned out! The cups were a fun addition to our Crawfish Boil. Everyone wanted to take one home as a souvenir of the day. The 2 day rush at no extra charge ensured prompt delivery. I have not seen them yet, but had them shipped to my daughter for her May 17, 2017 Wedding in OBX, they love them and will be perfect ... Cheers to many years of cold beers! Recommend this product!! Our guests will love it! Our cups were perfect! We used them for the reception and as party favors and our guests loved them! Our proof arrived quickly and the cups shipped only a few days after so we received them with plenty of time to spare before the wedding! I highly recommend them and would even use them for other events in the future! I loved how these cups turned out. Exactly what I was expecting. Looking forward to using them next month! These came right on time, looked just like the proof I was provided and were very good quality! I would order from this site in the future 100%! Easy ordering on website. Product exactly what I wanted and delivered quickly. Will order from this company again. My fiance and I were contemplating what we should do for a "parting gift" on our wedding day since we're having kegs and traditionally people do coozies. When we got these cups, I knew they were the right choice! They are not cheap in material like I was originally concerned about - they are the same as if you were getting a souvenir cup at a ball game. Definitely recommended! My product was exactly as the proof showed it to be and my fiancé loves them too. Items arrived quickly too. No complaints at all!